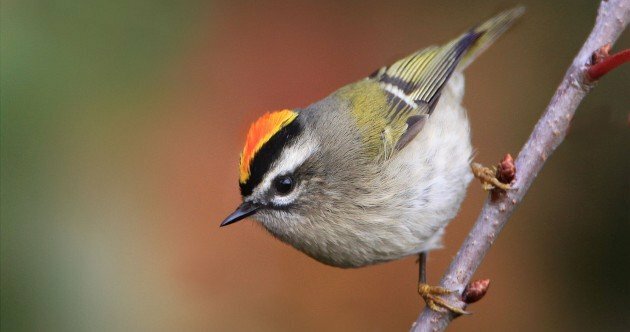 The kinglets and crests were long considered part of the enormous “Old World warbler” complex (“Sylviidae” in the old sense); for example, Regulus was included in Sylviidae in the first edition of the AOU checklist in 1886. It was removed in the 33rd Supplement (1976) and placed in Muscicapidae — another gigantic, messy taxon at the time — and then in the 34th Supplement (1982), it was placed in its own family, Regulidae. By the 1990s, early DNA studies were indicating that indeed, Regulus did not belong with the other groups represented in Sylviidae (and by the mid-2000s, that whole clan had been split apart, but that’s another story). In fact, kinglets and crests form an old and distinctive lineage within the Passerida clade of songbirds. The best evidence available so far puts them somewhere near a group of three superfamilies: Bombycilloidea (waxwings, etc. ), Certhioidea (treecreepers, nuthatches, gnatcatchers, wrens, etc. ), and Muscicapoidea (a very large group including oxpeckers, mimids, starlings, dippers, thrushes, and muscicapid flycatchers and chats). But exactly how those three groups and Regulidae are related is not year clear. John Boyd has summary of the situation and the literature on his Reguloidea and Bombycilloidea page. Within the family group, Ruby-crowned Kinglet is unique in many aspects of morphology and voice and is not closely related to the other members of its family. Some authors have argued for a separate genus, Corthylio, but without success. 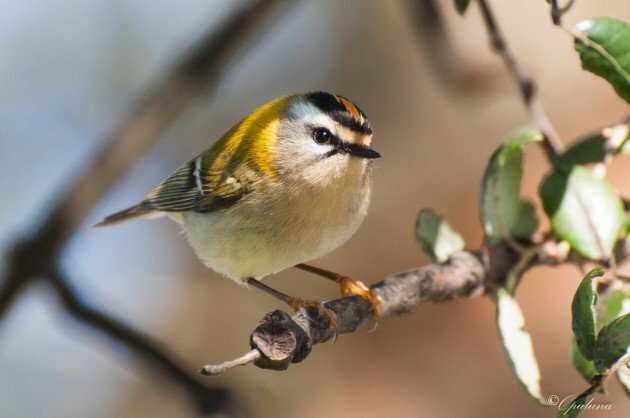 The Western Hemisphere’s Golden-crowned Kinglet is sister to the Eastern Hemisphere’s Goldcrest, and Madeira Firecrest — of the eponymous Atlantic islands — was only recently split from its mainland relative, the Common Firecrest, which includes a diversity of subspecies from the Canaries and the Azores all the way to Japan. The Handbook of the Birds of the World Regulidae family text has further details on all this and more. Don Roberson has a great family page too, and a couple of years ago, Corey compiled some of the best kinglet photos from right here on 10,000 Birds. So next time you encounter one of these diminutive monarchs, pay a little respect: They’ve carved out a unique and long-lasting dynasty for themselves in a very big world, and they’ve done it with flair and panache. Ruby crowned kinglets winter along the upper Texas coast. While hard to spot I have seen them foraging for insects in the abundant live oak trees we have in southern Harris, Galveston and Brazoria counties.